Encinitas Short Sale that should never have been…. 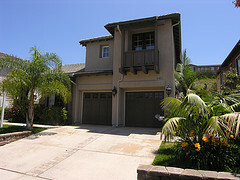 Kudos to the patient buyers of this Encinitas short sale, because they truly got a terrific deal ($890,000). It was group hug time Friday afternoon when we received confirmation that our 10-month short sale ordeal in Encinitas Ranch had successfully recorded and closed. Welcome relief is also due the out of area young seller, who had been unwittingly pulled into a raunchy real estate transaction by a couple of sleazy mortgage brokers (one of whom was the seller) , a credit “packager” –and escrow, title and appraisal personnel who surely knew better than to facilitate such a sham. Our first time home buyer-turned-seller from Los Angeles, with excellent FICO score (and no savings), was lured by the promise of buying an “undervalued” $1.2 million home (100 percent financing) in San Diego that he could profitably sell 6 months later–while someone else made the payments. It was to be his stepping stone to riches. Or so he thought.
. The “credit “packager” forged our client’s name and leased the property at under-market rent. He collected rents and deposits for about four months, until we listed the Encinitas home for sale. At that time, the tenants began paying rent to their attorney and barred us from showing the home. Now, we were dealing not only with a short sale, but a listing that could not be shown. tenants and their attorney would not allow anyone in to see the home.
. Foreclosure sale for this Encinitas home had to be stopped three times because the loss mitigation department of this major lender has a major interdepartmental communication problem. Real estate commissions were slashed by the short sale lender, but that is nothing new. They also refused to pay HOA fees that were in serious arrears, the home warranty for the buyer, utilities in our name, and a list of other necessities required for closing. But sometimes achieving the impossible is almost worth more than monetary compensation. Monday morning, I will order the sign removed from this Encinitas property, where it has probably set a record for the longest-standing Realtor’s sign in Encinitas Ranch. The neighbors will breathe a sigh of relief–and so will we. Listed below are other Encinitas Ranch homes listed for sale, with most recent offering showing first. If you have any questions, call Roberta or Scott Murphy at either 760-942-9100 or 760-613-6190. Congratulations are in order to you, Roberta Murphy, for a job well done in closing the short sale from hell. Ten months in escrow…that was one, big overdue baby! A great feel-good ending to what appears to have been an excruciating, nightmarish experience. Thank you! It will feel so good not waking so early to call WAMU back east at 6 a.m. Encinitas Ranch will also be immensely relieved to have wonderful new neighbors. Glad to hear you are done. I have a few horror storied going on up here in Santa Barbara. Hopefully the outlook seems to be that short sales will start to be a little easier. San Diego short sales and foreclosures are becoming far too commonplace. Fortunately, some of the lenders are now aggressively trying to save many of the defaulted San Diego homeowners. Somehow, I think Santa Barbara will not be quite as hard-hit with foreclosures and short sales as the inland areas of San Diego. Great job hanging in there. I, too, just hung on to two short sales and incurred some of the same lender problems. I continue to work these deals in Santa Barbara and find that they are going more smoothly and slightly faster. The interdepartmental communication can be the worst! Utimately, getting it done is what matters. Your communication skills were put to great task. Congrats!